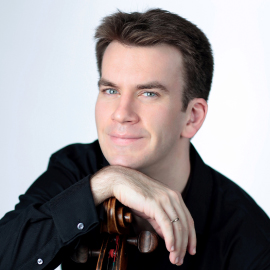 Cellist EDWARD ARRON has garnered recognition worldwide for his elegant musicianship, impassioned performances, and creative programming. A native of Cincinnati, Ohio, Mr. Arron made his New York recital debut in 2000 at the Metropolitan Museum of Art. Earlier that year, he performed Vivaldis Concerto for Two Cellos with Yo-Yo Ma and the Orchestra of St. Lukes at the Opening Night Gala of the Caramoor International Festival. Since that time, Mr. Arron has appeared in recital, as a soloist with orchestra, and as a chamber musician throughout the United States, Europe and Asia. The 2012-2013 season will mark Mr. Arrons 10th anniversary season as the artistic director of the Metropolitan Museum Artists in Concert, a chamber music series created in 2003 to celebrate the 50th anniversary of the Museums prestigious Concerts and Lectures series. In the fall of 2009, Mr. Arron succeeded Charles Wadsworth as the artistic director, host, and resident performer of the Musical Masterworks concert series in Old Lyme, Connecticut, as well as concert series in Beaufort and Columbia, South Carolina. He is also the artistic director of the Caramoor Virtuosi, the resident chamber ensemble of the Caramoor International Music Festival. Mr. Arron has performed numerous times at Carnegies Weill and Zankel Halls, Lincoln Centers Alice Tully and Avery Fisher Halls, New Yorks Town Hall, and the 92nd Street Y, and is a frequent performer at Bargemusic. Past summer festival appearances include Ravinia, Salzburg, Mostly Mozart, BRAVO! Colorado, Tanglewood, Bridgehampton, Spoleto USA, Santa Fe, Seattle Chamber Music, Bard Music Festival, Seoul Spring, Great Mountains, and Isaac Sterns Jerusalem Chamber Music Encounters. Mr. Arron has participated in the Silk Road Project and has toured and recorded as a member of MOSAIC, an ensemble dedicated to contemporary music. Edward Arron began his studies on the cello at age seven in Cincinnati and, at age ten, moved to New York, where he continued his studies with Peter Wiley. He is a graduate of the Juilliard School, where he was a student of Harvey Shapiro. Currently, Mr. Arron serves on the faculty of New York University.